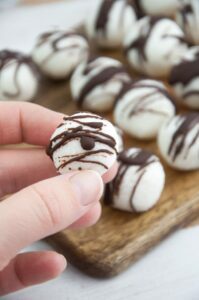 These Vegan No-Bake Coconut Balls drizzled with chocolate are the perfect treat! They taste just like bounty (or a mounds bar). And the best part, you’ll only need 5 ingredients to make them! 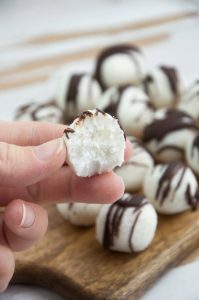 These vegan No-Bake Coconut Balls are perfect for the summer AND for the winter (they look like little snowballs, don’t you think?). No-Bake desserts in the summer are great because I don’t want to heat up the apartment even more. And in the Christmas season, I love to make these no-bake cookies because they add a nice variation to mixed cookie plates. They are like mini bounties or mounds. You could even coat them entirely in chocolate, then they will look even more like bounty balls! 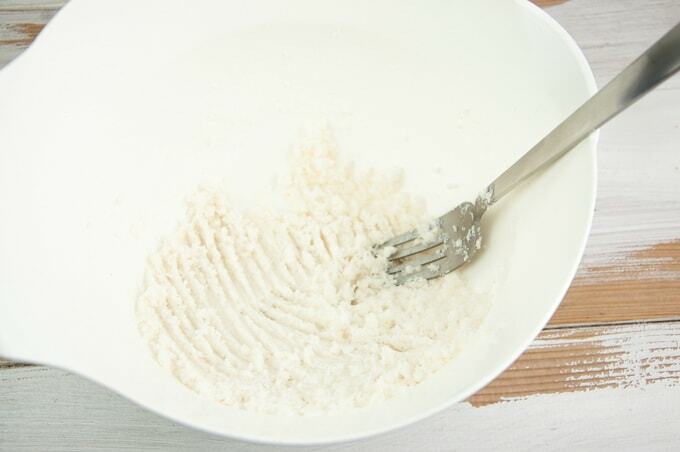 Step 1: Combine shredded coconut and powdered sugar. Then add coconut milk and coconut oil. Step 2: Mix everything together with a fork. Step 3: Form little balls. Melt chocolate in a double boiler. 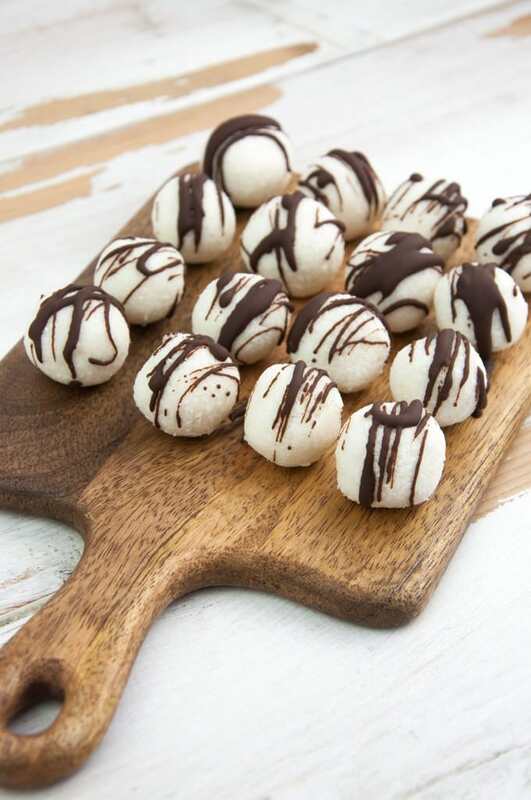 Step 4: After letting the coconut balls harden in the fridge for a bit, I’ve drizzled the chocolate over the coconut balls – a spoon or a fork works great for this. Step 5: I then placed them back in the fridge for the chocolate to harden but this only took a few minutes. Then they’re good to go! Enjoy and leave the rest of these beauties in the fridge as the coconut oil may melt at room temperature. The Coconut Balls are rather soft because of the coconut milk – if you want them to be firmer, use more coconut oil and less coconut milk. Can these be frozen? Absolutely! Let them thaw in the fridge overnight when you’re ready to enjoy them. My mixture doesn’t stick together. What did I do wrong? Just add a bit more coconut oil or coconut milk to the mixture. You probably have used just a bit too much shredded coconut. Can I use another sweetener than powdered sugar? You can use rice syrup or agave syrup (maple syrup would work too but the balls won’t be that white) or you can use your favorite powdered sugar alternative. 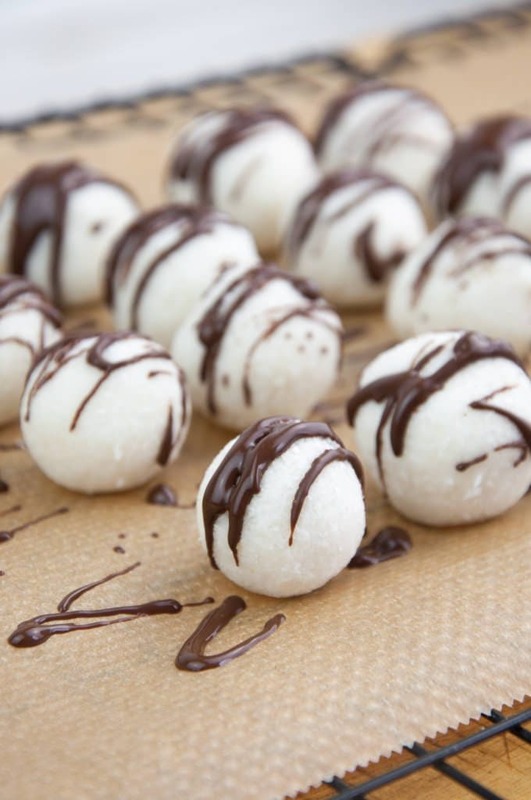 These Vegan No-Bake Coconut Balls drizzled with chocolate are the perfect treat! They taste just like bounty (or a mounds bar). And the best part, you'll only need 5 ingredients to make them! 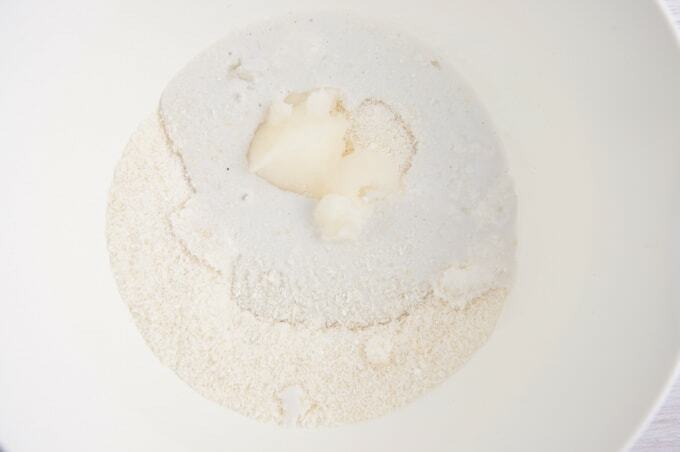 In a mixing bowl, add shredded coconut and powdered sugar. Combine with a fork. Then add the coconut oil and coconut milk. Mix again with a fork until the mixture starts to stick together. Use your hands to form balls (you'll end up with 15-20 balls depending on how large you make them). 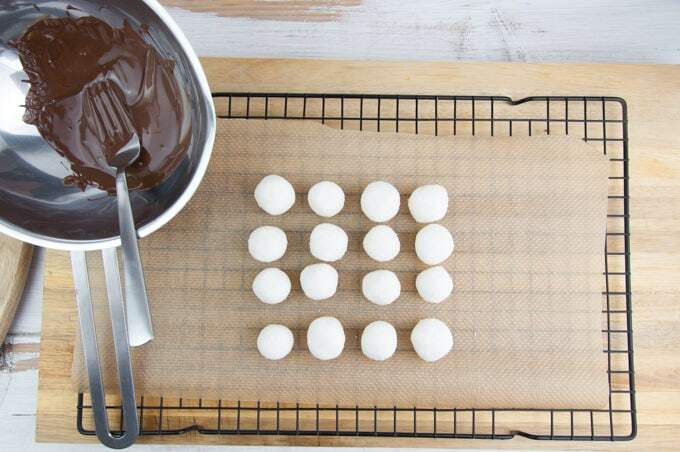 Place the balls on a plate lined with a baking sheet and place them in the fridge to harden for at least 15 minutes. For the chocolate coating, heat the baking chocolate in a double boiler until melted, swirl it over the coconut balls with a fork. 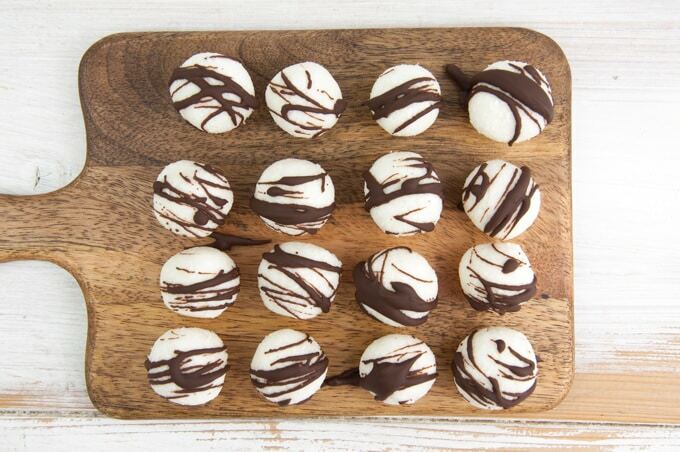 Put the coconut balls back in the fridge again until the chocolate swirls harden (approx. 1/2 hour)! Enjoy! Keep them in the fridge for storage. This post was first published on September 10, 2015. Updated on December 4, 2018. 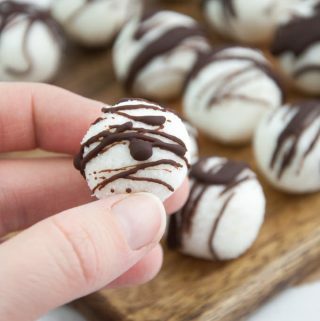 Snow balls with chocolate drizzles hugs!!! These look to die for! ohhh I love that description! :D Thanks Rebecca! So FUN so creative and so picture-esque! picture-esque! Love it :D Thanks Jennifer! These are just so adorable and just perfect for coconut lovers! I love the gorgeous chocolate drizzles! These look like little pieces of art! I love how the chocolate is haphazardly drizzled on them. So pretty!! But, not too pretty to eat. I could probably pop several of those at a time!! Yum! Yum! Coconut and chocolate is such a delicious combo. These look great! I love how easy these are! Perfect sweet treats for a summer afternoon :D I love how you’ve drizzled the chocolate on top, it’s like…effortless yet artistic! I love coconut treats like these! Now that you’ve called them snowballs I just want to stack them up and make a snowman. I can’t seem to get these to stick together. What do you think I did wrong? Would Coconut cream work just as well? Yeay! :) Thank you! Oh yes! I think coconut balls with a splash or red beet juice would be amaaaazing! Pink coconut balls! Woop woop!